Keith Stanzel moved to Myrtle Beach in 1990 to “get into the golf business”. He has certainly accomplished that and much, much more. Keith is well known to everyone connected with the industry in the Myrtle Beach area. Keith was born in Gloversville, New York and attained a Masters Degree in banking, but always had a passion to be in the golf business. What better place to achieve that than “the Seaside Golf Capitol of the World”, Myrtle Beach. So in 1990 he packed his bags and headed off to fulfill his dreams. Keith served as Director of Tournaments for Burroughs and Chapin for many years and went from there to be the Director of Marketing and Sales for TPC Myrtle Beach. Currently he is the Marketing Director for Whispering Pines Golf Course. Serving in his capacity at Whispering Pines is more than a full time job, but Keith still finds time to enjoy some of his other passions such as going to the beach, golf and cooking. As far as following his favorite sports teams he pulls for everything New York and the Ohio State football program. Keith has served as a past president and is a current board member of the Grand Strand Golf Directors Association. The GSGDA is a group of area professionals associated with golf marketing for the greater Myrtle Beach and Grand Strand area. 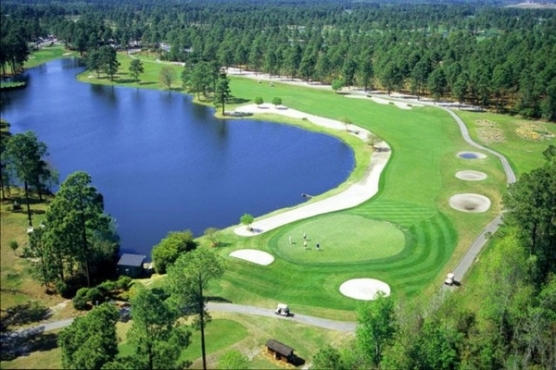 Atlantic Golf Management recently took over operations of Whispering Pines Golf Course from the City of Myrtle Beach. Keith is currently busy marketing the course that has already seen many improvements and has many more planned. Whispering Pines is conveniently located at the front door of the Myrtle Beach International Airport and they offer pickup service from the airport and luggage storage for golfers arriving that may want to play on the day of arrival or departure. Golfers can also Fed Ex their clubs to Whispering Pines to insure delivery and take the hassle out of collecting clubs at baggage claim. Now that’s SERVICE! Take the opportunity to play Whispering Pines and you will be pleasantly surprised. If given the opportunity you also want to visit with Keith who is a very entertaining gentleman.